Another in our series of free resume templates, this one has a clean layout having all your info lined up on the left side of the page. There are no lines or distracting graphics, it was designed to be read quickly to deliver your information in an unobstructed way. This template has the same layout as our ASCII template except that it isn't plain text. If you are interested in that format we have that too. Your name is larger to attract the most attention and help make it memorable. Your address, telephone and email are next below your name. The titles for each section heading are capitalized. Any custom section heading titles you create will also be capitalized so they all have the same styling. The Education and Employment sections have bold fonts for the school and company names, the cities and states, the dates, the job titles and degrees. The details for each section including the Objectives and Skills are normal fonts. Changing fonts, colors and styles is done with a click of your mouse or tap of your finger on a mobile device. 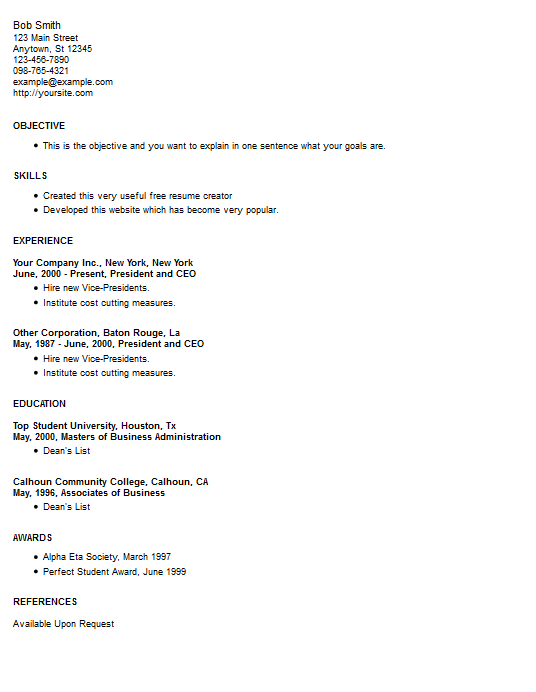 Receive this template from our free resume creator, while there you can get help to write your resume correctly if you read the articles in our help library.